I am trying to burn a Blu Ray disc but I can't seem to find a way to burn one with a play all option. 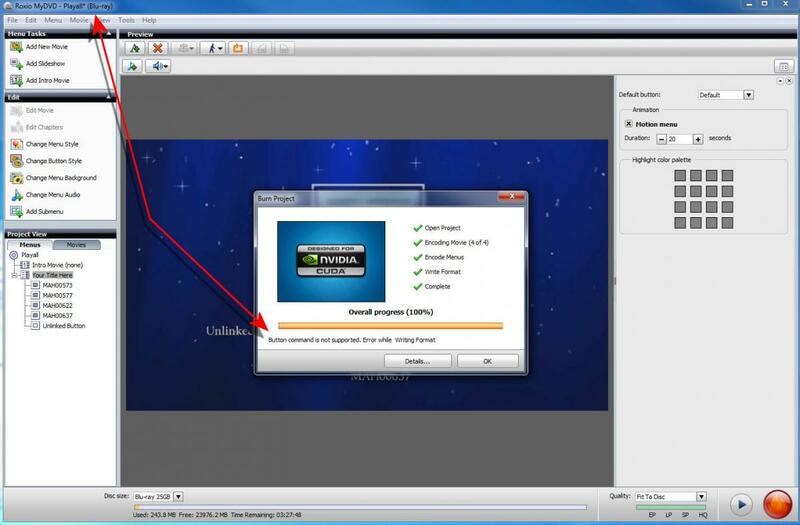 I found a menu that has an option for choosing if when you click on a video file it plays just that video file or all the files on the disc but as you can see for some reason the program will not let me select either option. Can anyone tell me what I am doing wrong and how I burn a Blu Ray disc that will play one tittle after the other until the disc is finished? Thanks for your time and help. Why use a menu at all? If you don't use one, they will all play one after another as soon as the DVD is put into the drive. This will continue until you turn off the DVD player. They will? I didn't know that. I thought I had to make a menu,thanks. Still if anyone knows how did get a play all option with a menu I would be grateful for the help. Thanks again. Play All, cannot be done with Roxio! Will that program work with windows 7? What are they thinking. A Play all option has been standard in every DvD burning I have ever used including the free ones. Why does this one that I paid $80 not have that option. Boy I wish I had found out before hand. Talk about a substandard program. Well I will not be touching anything made by Roxio again I can tell you that much. Thanks for the warning. I just wasted two blank Blu Ray discs and seven hours of my time trying to get a play all option to work and I was going to spend more time on it. Thanks for the warning. DrCrowRobot,	Although there is no "play all" option (that I know of) you do have the option to add all movies as one movie. Use the Windows command to select all the movies you want on the disc, when you click to add them, you will get a dialog to the effect of "Do you want to add all the movies as one or do you want to add them separately". If you add them as one, you will get one button to push. That way you have the menu (which is highly customizable) along with one button. The movies will not start until the button is pushed. There is another way but I have not tried this on a blu-ray disc. If you do try it, make sure that you burn to an eraseable disc to try. Select the menu you want. Go to the top, select menu, then select add Unlinked button. A button will be added. Add the rest of the movies. For the trial, keep it to 3-4 . Now select that "Unlinked button and then go to the navigation and select to play all movies in menu. That works for standard DVD, I don't know if it works for blu-ray. See image for clarity. Thanks a bunch. I will give that a try. Thanks for all your help. I still think I will give that Sony Vagas program a try as soon I have some money. Since ABC is not releasing it on Blu Ray I have been recording Castle on my computer in HD and the way the cheap program I have works I have to stop recording at each add break so I can't really burn it onto a Blu Ray disc with out Play All as an option. Thanks again for all of your help. I just really like having a menu so the disc doesn't start the second I put it in the player. Thanks again. Sorry , I didn't expect you to be around. I edited my post above to offer another suggestion (with image). It works for standard DVD; I don't know if it works for blu-ray. Ah ! you are now talking about chapters and not separate videos if I read you correctly. What you should be doing is putting all the sections of the edited video in Video Wave. They will add seamlessly. If you add the entire movie to video wave, you can edit out the commercials in that program. 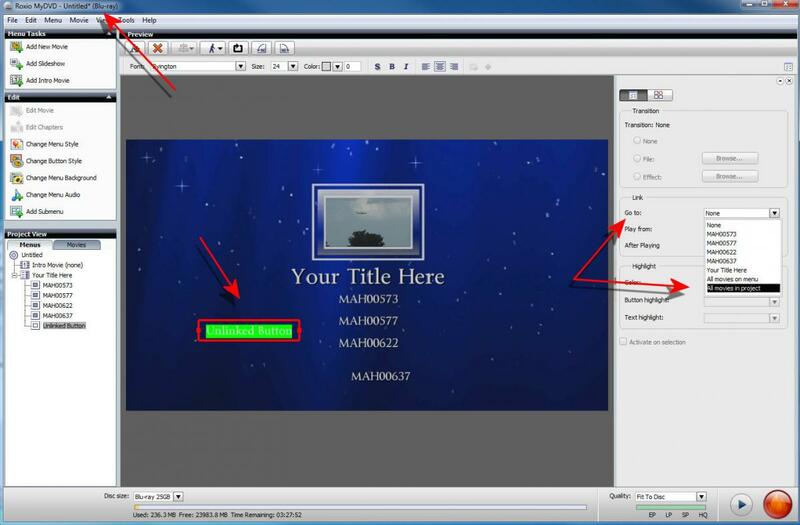 You can save the project and add it to MyDVD or you can output the video to a video file. You then can add as many videos as you want to Create DVD. 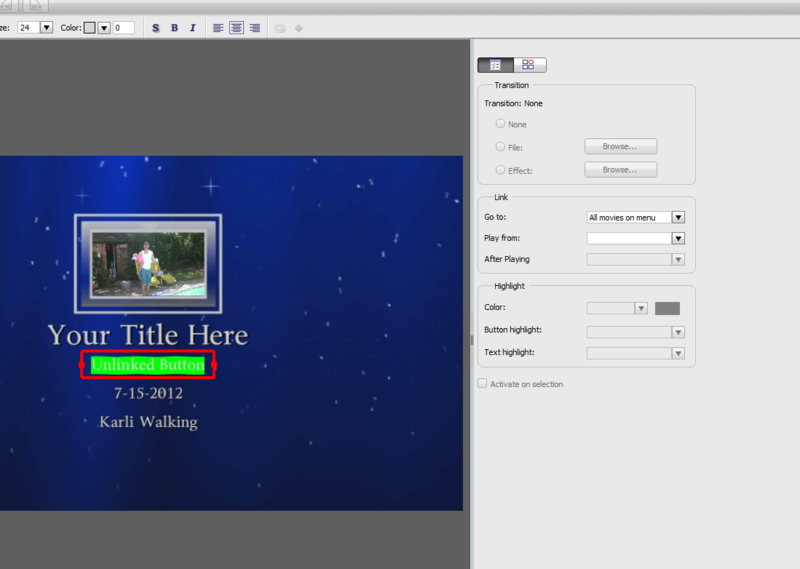 If you want each episode to have chapters, you can add them in Create DVD. When you select that episode, you will go to a sub menu page where, if you select the first chapter, the episode will play to the end and then return to the menu so you can select another episode. How long are your edited episodes? If they are about 40 or so minutes long, consider making AVCHD discs. They are high definition discs make on a standard DVD but will play on a blu-ray player. They are the same resolution as blu-ray but much cheaper. If one of these look good to you, come back for more information. The only thing that I have found that works is to add ALL the movies as one Title and call it 'Play All'. Then add ALL the movies again as individual Titles. after saying that, I just tried it in NXT and it seem to work??? Okay if it works please let me know. I would pay the $30 to upgrade to that version but I want to be sure it will work before I pony up the cash. Thanks again for your help. I tried that and it didn't work. When you click the button it only plays the first tittle on the disc and then goes back to the menu. But when you try to Burn it if fails! Oh for crying out loud how hard can it be to make a Play All option?! Thanks for all your help. I guess I will be getting Sony Vagas. Good night,this is really strange if you ask me. Okay I will try that. I'll have to wait until I can get to the library(there is no highspeed internet where I live)and download the program. I will give it a shot. What program are you going to download? Roxio or the other? If Roxio, you already have it. Oh wait,it seems it came with Pro 11. I will give it a shot today,thanks. Read this about Chapters, Scenes and Things. Read this about work flow. Both excellent psots on making and editing standard definition projects. The process is the same for HD. Just remember to select wide screen when you first open "Video Wave" (aka Edit Video -Advanced"
Thanks a bunch. This is a big help. I tried out video wave last night and it did a great job of combining all those titles into one,thanks a bunch.